Although, the Estes Park Wool Market usually takes place in the blistering dog days of summer it surprised me this year in the middle of June. I was unable to make it due to the date change but, that doesn't mean we can't look back on the fun. The four-day weekend consisted of shows, demonstrations, shopping and workshops where you can learn how to spin, sheer, weave and knit. From what I hear the knitting and spinning corner was new this year but, it taught some valuable information. The sheering has always been one of my favorite things to watch but, now being able to get up close with the animals makes it just that much better. There were over 28 workshops to participate in while the kids were in Barn W taking advantage of the hands on activities including getting to know the animals up close and personal. The workshops began on June 8 and were held through the end of the day on June 9th. A majority of the workshops were only held for one day however, 4 out of the 28 went through Thursday and Friday. On the third day of Wool Market the workshops were over and the shows began. There were a few different shows that took place. For instance, the rabbits and goats show off their cashmere and angora fibers. 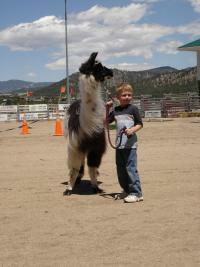 While the alpacas, llamas, and sheep participate in the performance and demonstration shows. Some of the demonstrations include herding dogs strutting their stuff in the arena with the sheep. It is quite amazing to watch those dogs work. Not to mention the fiber animals who appear to pose throughout their shows. If you're a shopper, the Wool Market is the place to be on this summer weekend. Everything from hand spun yarn, gloves, hats, and purses are available to buy. Made from the purist of materials including cashmere and angora. After all was said and done and I realized that I missed the event it got me excited for next year. Our wonderful village puts on some amazing events that keep growing and growing year after year. But, now I will keep a better eye on when these events are coming up. So, come on out and join me for next year's Wool Market!